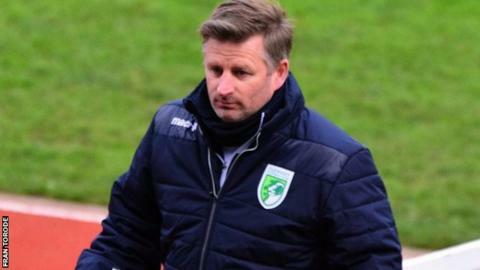 Guernsey FC boss Tony Vance has hailed their 2-0 win over Worthing as one of the best in the club's history. Ross Allen scored both goals as a Guernsey side with just two substitutes - one of which was a goalkeeper - moved up to fifth place in Isthmian League Division One South. "We had nine fit players because Craig Young and Tom de la Mare should not have been playing," Vance said. "They've defied the physio's advice and worked their socks off for the team." He continued: "We had Miles Pengelly as one sub and Jakub Machlowski as an outfield goalkeeper sub - that's what makes this a fantastic result. "It was probably one of my best moments at Guernsey FC." Worthing, who were second in the division going into the match, had lost just once in the league since the middle of September. "Credit to the lads, they were outstanding," Vance told BBC Radio Guernsey. "They applied the tactics to another level and they deserved the win, it was outstanding what they did."